Portastorm wrote: Well I guess we’re all afraid to say something ... but what the heck, I’ll jump off the diving board first. 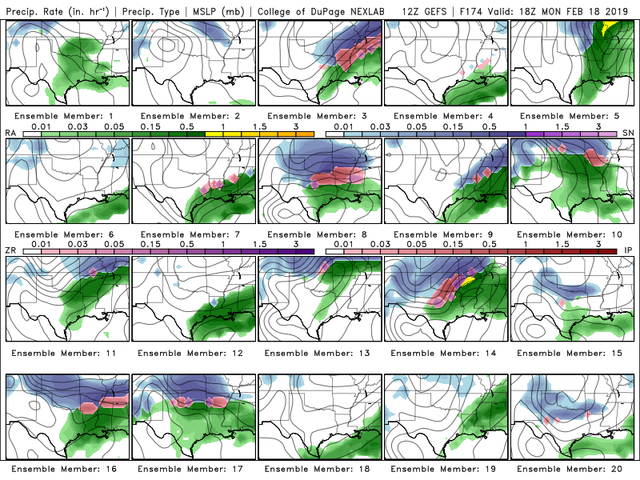 The period around Feb. 18th looks intriguing for Texas and the prospect for wintry weather. All the models are showing it. As always the details remain to be determined. Looking like another marginal type of event, same as we've seen a few times across Texas. Maybe snow pellets or sleet again. Not looking like the whole air column will be cold enough for a significant snow event. Still a long way out, though. My initial thought is that we'll see something less than we saw last week in terms of winter weather. 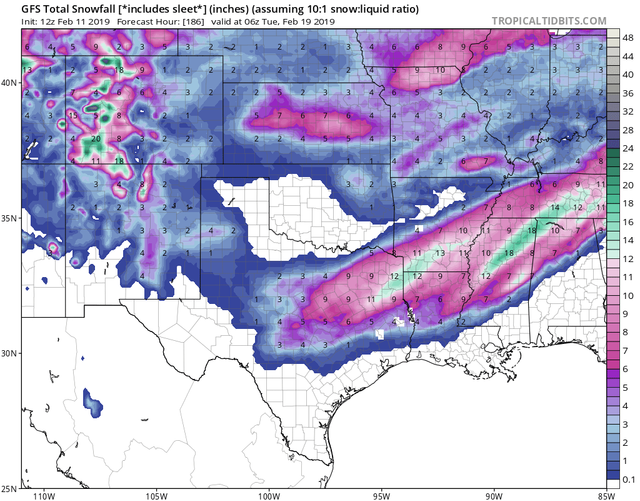 Realistically, is there ever a slam-dunk type wintry precipitation event forecast in the South? It was a sure bet, Winter Storm Warning a couple of weeks ago in Mississippi and Alabama, not even a flurry. Mr. Heat Miser - when you get a chance, will you please break down the 12Z GFS meteogram for next Monday in both DFW and Austin!!! Well 12z GFS certainly had too much coffee this morning. orangeblood wrote: Mr. Heat Miser - when you get a chance, will you please break down the 12Z GFS meteogram for next Monday in both DFW and Austin!!! Heavy snow for the D-FW area. I certainly believe it. Hope you do get a snow storm up there. Then we can proclaim winter to be over. Yes Alex, I'll take the 12Z GFS for $1000 please!!!! About as beautiful of a picture as you can draw in the South!!! You folks should frame the 12Z GFS. What time frame on Monday? I'm driving back from Caddo Lake that day. gpsnowman wrote: What time frame on Monday? I'm driving back from Caddo Lake that day. Obviously, this is way too early but according to the GFS.....Early Monday morning frozen precip begins to break out and ends Monday evening! If were anything close to being correct, travel plans Monday and Tuesday need to watched closely! Last edited by orangeblood on Mon Feb 11, 2019 11:37 am, edited 1 time in total. See? Good setup! Good trends! Not all hope is lost! Edit: And the temps are below freezing for more than a day!! That’s just the perfect snowstorm! Thanks orangeblood. Yes it is still early but I just wanted to see to prepare. Hopefully a good week of trends coming up. Cerlin wrote: See? Good setup! Good trends! Not all hope is lost! And another system later in the week...shades of late Feb/early March 2015!! Is the GFS MOS page working for anybody? what part(s) of Texas are we talking about here? Thanks. I’m curious to see if the Euro will hop on board...but I would love another end of 2015 repeat! Monster Westerly Wind burst. The last one with such magnitude in the month of Feb was likely 2015 that jumpstarted the Big Nino. Daily SOI -19.02. Coupled with strong WWB with some lag time, sometime in the next 2-3 months I would probably forecast a flooding type event somewhere in Texas at some point. Hopefully, this was not a rogue run.... see what the ensembles show. Maybe I will just stay at Caddo Lake instead of coming back on Monday. The 12 inch zone is right on top of the lake!